As the foster-gardener of the Urban Veg Patch, and therefore grower of edibles, I've long wanted to attend the Edible Garden Show and see what it's all about. This year the show has been relocated from Stoneleigh in the Midlands to Alexandra Palace in North London, a short drive from my home, so off I went. Ally Pally is a huge building, high on a hill with extensive views over North London; the show is located in the south side of the building as I found after I'd walked all the way round ... past the fitness club, past the lake, past the ice rink, past the café, past the BBC tower, past the car park that I couldn't find - you get the idea. Once inside, the show was a visual feast, with no aspect of home-raised food neglected. As I wandered around looking at the exhibits, there were many products that I recognised and quite a few that I felt had a lot of potential for education. As ever with these shows, there was plenty of opportunity to chat with the exhibitors and it's this access to information which is so valuable to gardeners. Talks and workshops run throughout the day, staged in 'theatres', one stage for cookery, two for gardening and a poultry area. James Wong was a particularly effective speaker in the Experts Theatre and I managed to have a chat with him about his new book that he's currently writing and researching with the RHS (working title 'RHS Flavour Growers Manual', due out next year). In the Poultry Area, a small group of school children clustered around a warming pen for 3 day old chicks, anxious for a turn to hold one. For anyone thinking of keeping poultry, this area was sure to excite. 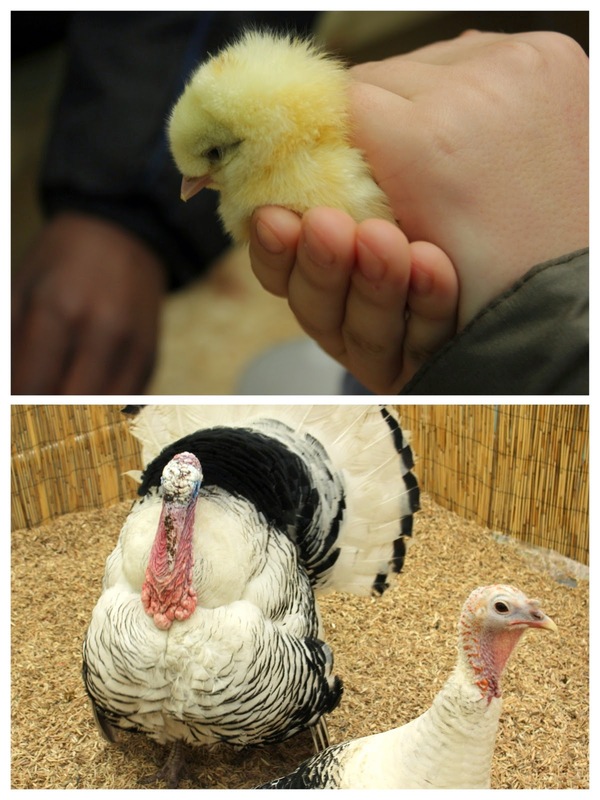 The sound of chickens, ducks and gobbling turkeys filled the air, with advice on hand about the characteristics of different breeds, how to house and care for them and, of course, plenty of equipment to buy. After a good look round, several glasses of water (it was very warm in the building!) and lots of chat, there were four exhibits that I was especially interested in. Compost Cocktails, Dragonfli (bees by post), Plantspacer and Meadow in my Garden. I felt that these had definite possibilities. First, Compost Cocktails: New for this show and hosted by the company behind J Arthur Bowers and New Horizons composts. In a booth with shelves filled with jars of powders and potions, tubs of dark crumbly mixes and a 'cauldron' for mixing, this fun idea educates in the dark arts of soil composition. In short, how to create the ideal soil conditions for growing particular crops. So if you want perfect carrots, plump cabbages or luscious fruit, you'll know the right soil to use - basically getting the NPK ratio right for your crops. (NPK = Nitrogen, Phosphorus, Potassium = Roots, shoots, fruits). This was something that visiting school children were eager to engage with, getting their hands into the soil, learning about peat and environmental impact, but mostly having a lot of fun mixing soils to a recipe for successful growing and turning the drums to mix. Multi-sensory learning, works every time. It's a different way of presenting soil composition (including peat, coir and green compost) and, after more trialling in local schools, the company hope eventually to take the idea to the RHS. Personally, I could see potential for both school gardening clubs and entry level horticultural courses. The premise of mixing soils to suit a purpose is exactly how the company makes the bagged soil available to the public. What could be more important than soil? Next up, Plantspacer from Squared Gardening. This is one for the novice veg grower, school gardening club or, indeed, anyone with limited growing space. A set of three square templates punched with circles as planting guides; pictures show which veg suits each template and how many of a chosen plant can fit in that area. The templates also group together plants that have similar nutrient requirements. The principles of square foot gardening made simple. Actually, I think I need some of those as I always slightly scoff at the planting distances on seed packets and weeding between plants is not my forté. And so to pollination. Bees. Live bees were at the show. Unsurprisingly, of great interest to the school children. How do the bees get out, asked one. Hmmm, that's just a little too much information, I thought. Curiosity got the better of me and I had a chat with Julian Ives, proprietor of the company, Dragonfli. The idea is less about making honey and more about pollination. With a hive and colony of bees in the garden, good pollination of fruit blossom and vegetables will improve yields. A colony and hive is provided by the company; during the season, new queen bees are produced by the colony to fly off and create new colonies in the wild. I wondered how customers felt about having to replace their colony every year (the old one naturally dies) but was assured the company has a very good record of repeat orders and was becoming popular as a learning resource for schools. I had some concerns over packaging up bees to send in the post; wouldn't that be traumatic for them? Apparently not. The bees are sent by courier in a sealed box with food and water for the journey and would be quite happy for several days. 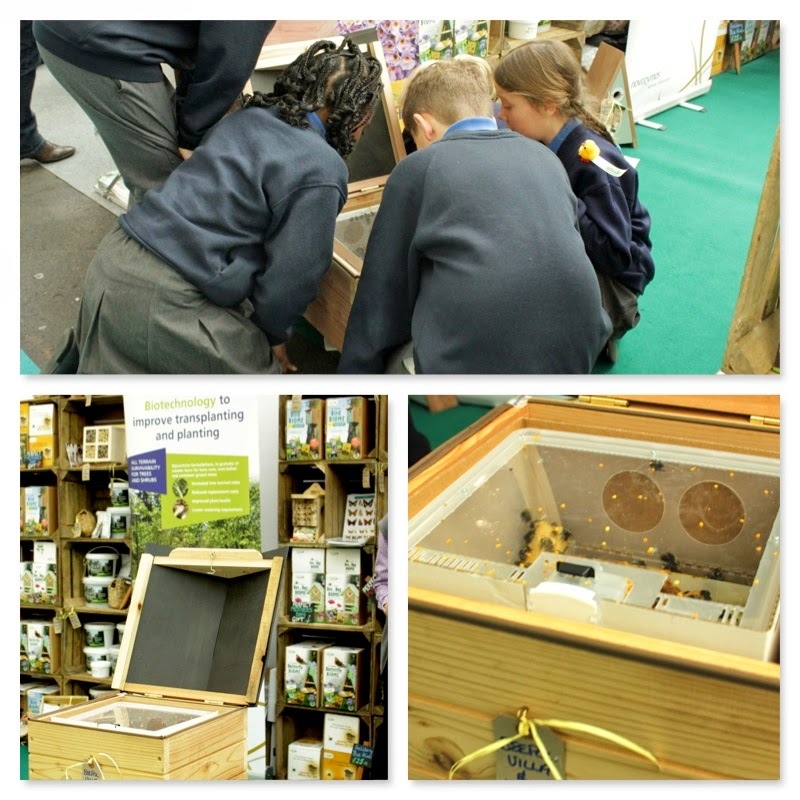 The company also supply solitary bees, seeds and organic pest controls. Personally, I love sitting in my summer garden, surrounded by the droning of busy bees and would love a small hive. ... Although, perhaps not in a community garden. Still on the topic of pollination - and sited next to the bee hive stand - was Meadow in My Garden. I encountered this exhibitor at another show last weekend and was immediately taken with their product, packets of site or colour specific grass-free wildflower seeds to attract beneficial insects to the garden. I'm improving the area under my fruit trees with herbs and flowers this year. A tricky area given that it's shaded in the summer when the trees are in full leaf so I bought a packet of short mixture Tree Foot seeds. This should give me a display of 24 flowers including Catchfly, Swan River Daisy, Carpet Flower (Sweet Alyssum) and Corn Marigold, none taller than 40cm. Mmm, lovely ... and because the seeds are a mix of annuals and short lived perennials, I can look forward to at least two summers from my floral meadow. It helps to know what you want though as there is a massive choice - surely not a problem! Mixes for dry soil, wet soil, shade, bees, butterflies, aphids, shade, drought, planters or larger borders ... they're all there. I have a larger box which I'll probably use for a spot of guerrilla gardening around the neighbourhood and, looking at their website, I'm drawn to the blue mix of white cosmos, blue cornflowers and plum coloured scabious. 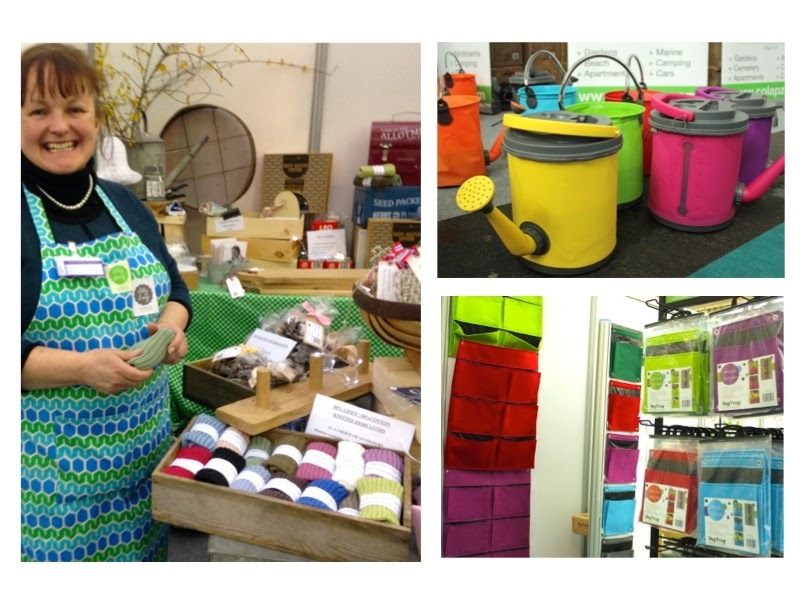 Other ideas spotted that are worth a mention are brightly coloured collapsible water cans - perfect for car boots when going to the allotment, or using as a bucket when camping. I resisted but would like one for my tiny balcony as it folds up to a disc just a couple of inches thick. Also brightening up a vertical growing space are these felt grow pockets from Veg Trug. They're plastic lined so allegedly won't leak or stain and the water seeps down through the stitching so that the plants aren't waterlogged. I remain unconvinced that the roots will have enough space and they would certainly need daily watering but, for someone with no growing space, this could just be the answer as they can be hung outside a window or on a tiny balcony. (Um, like mine.) Probably useful for cut and come again salad leaves, small herbs, strawberries and nasturtiums. Interested? Here's the link. I also want to mention the lovely Kristen, above, who runs a small family business called Retro Heart and Home. She sells wonderful wooden products, such as the highly covetable peg rails made by her husband, and sources lovely products with a Scandinavian feel such as these high quality linen mix dishcloths. Everything she sells is a product that she loves to have in her own home. Recently, a certain very well known department store linked to a supermarket (allegedly) reproduced her christmas display exactly. So, if you want beautiful objects for your home, don't pay department store prices - go to Kristen first and support small businesses! If you haven't been to the show before, I'd say it was well worth it for the talks and workshops alone. Take some cash as there's masses of retail therapy in the form of tools, organic pest control, magazines, hoops and netting, gloves, raised beds, seeds (Suttons, DT Brown, Thompson and Morgan), herbs, fruit, plants ... and food, lots and lots of food. And a café and free parking. Half price tickets to the 2015 show! 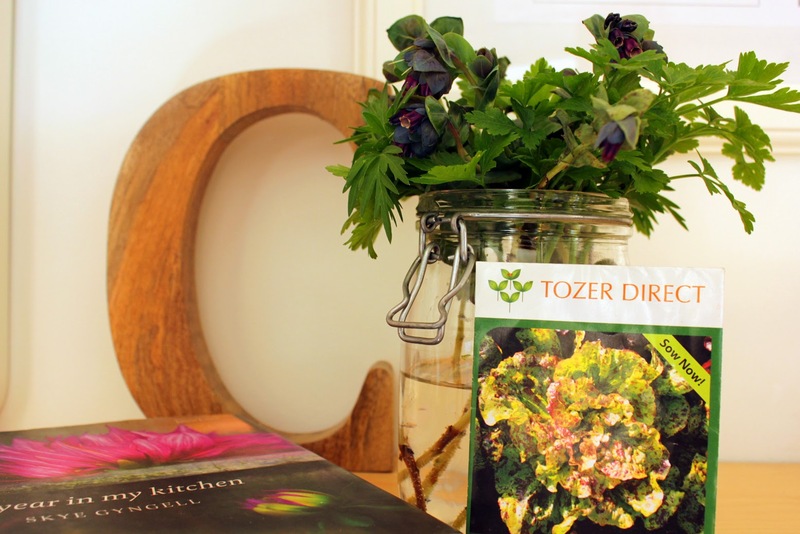 I see from the event guide that, until the end of April, register on the Edible Garden Show website and you'll receive newsletters and how to get this great offer. Pudding. Surely one of the most evocative words in the English language. At this time of year, if a pudding is to be provided from the garden then rhubarb is one way to go. So when a neighbour says that she has lots of rhubarb on her allotment garden* and to help myself, I don't need asking twice! I liked the look of a Danish rhubarb cake seen in the Guardian a couple of weekends ago but found that, unusually for me, I didn't have enough plain flour for the recipe. But I did have just enough to make a crumble topping, following a recipe from my Sarah Raven cookbook**. This recipe also has ground hazelnuts in it, as well as oats, which was rather nice. The rhubarb plant I picked from is several years in the ground now so has stood well over the mild winter, whereas my veg patch rhubarb plants are still just getting going. It looks like my friend's plant is ready to be split - there are several points (crowns) where the stems emerge. It's also good to mulch or feed rhubarb in the spring as this will result in better stems - chicken or comfrey pellets will do, or compost or well-rotted manure, but leave the crowns clear. If you have room to grow several rhubarb plants, it's a good idea to deliberately choose varieties that crop at different times; I noticed that the Capel Manor kitchen gardeners are currently picking stems from a well established Timperley Early with stems from 'Victoria' and 'Royal Albert' at about 4 inches and 'Stockbridge Arrow' crowns just peeking above the soil level. I'd borrowed a copy of the RHS Good Fruit and Veg Guide from the college library. I hadn't heard of either Albert or Stockbridge Arrow so wanted to see if the RHS rated them. They weren't listed in the book but I was pleased to see that both varieties that I grow - Champagne and Glaskins Perpetual - have earned a mention. The RHS describes the Champagne rhubarb cultivars to be generally early with sweet tender stems, whilst Glaskins P has a fair flavour but crops over a long period. I picked stems from my Glaskins rhubarb in early November last year but that's certainly unusual; it will be interesting to see how it does in the months ahead. There are two more plants that have piqued my interest from the RHS guide: 'Grandad's Favourite' (great name!) is described as a mid-season variety with excellent flavour, while the stems of 'Fulton's Strawberry Surprise' are tender and well-flavoured. This last one also has an RHS Award of Garden Merit. Ones to look out for at plant sales if looking to start a rhubarb patch. * When the flats were built, a small piece of land next to the railway was fenced off for allotment gardens, each typically measuring about 3 x 6 metres. Individual tenants could adopt a plot for growing fruit and veg. They didn't have to be pretty, just well maintained and productive. In recent years, a growing number of tenants have turned these spaces into private leisure gardens so most are now grassed over (or worse, buried under gravel) and get used on a handful of weekends in the summer. Three plots are still used for the intended purpose, my friend's plot being one of them. She's also one of the original York Rise Growers. Nuff said. We had to redraw a winner for the book as Susiesae did not get in touch. I'm pleased to say that the book will now be sent to Anna from Green Tapestry blog. Congratulations! Happy reading and flower growing! Number 32! Which, of course, means absolutely nothing yet. Read on. My recent review of Louise Curley's fabulous new book 'The Cut Flower Patch' had an amazing response - 74 comments from readers who would like to win their own copy. I asked readers to tell me of their favourite cut flowers and there were some lovely suggestions with repeat mentions for sweet peas, roses, freesias, jasmine, lilies, sunflowers, gerberas, lupins and cosmos. It seems we're all in love with scented flowers and I absolutely agree with Christine Dodd that the Sweet Williams on the book cover are gorgeous - one to add to my own plot, I think! My particular thanks go to Strepsy for Heliotropium arborescens; I had to look this one up and it sounds wonderful, being nicknamed the Cherry Pie plant as this is apparently what its scent is like. Yum! Numbers rather than names were used and I matched the chosen number to my list of commenters. 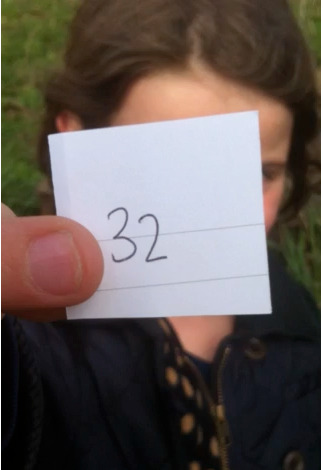 And the winner is … Susiesae, the 32nd person to leave a comment. Please could you contact me (use the Contact Me button under my blog header) or DM me on Twitter - your Blogger profile doesn't let me get in touch with you! My thanks again to everyone who took the time to leave a comment and/or enter the giveaway and to Frances Lincoln for donating a copy of the book. I'm noticing pots and containers filled with plants a lot recently. It's a part of garden design training that we're taught to appropriately plant up containers to fill gaps and provide seasonal interest so, as I walked through the Capel grounds on my way back to my library studies last Friday, I couldn't help but notice this pot which I thought was rather beautiful. It stands about a metre high next to a bench and is one of an identical pair. At the moment it's planted up with pink hellebores, vinca (trailing over the sides), euphorbia and griselinia (the tall rounded leaves at the back). Perhaps my photo doesn't do it justice but I think, when viewed within the garden surroundings, it has real visual impact and really adds to the overall scheme yet still blends in. I like that the smaller pot seen on the left, below, leads the eye up to the larger pot and bench and both pots echo the shapes of the surrounding planting in the border behind. 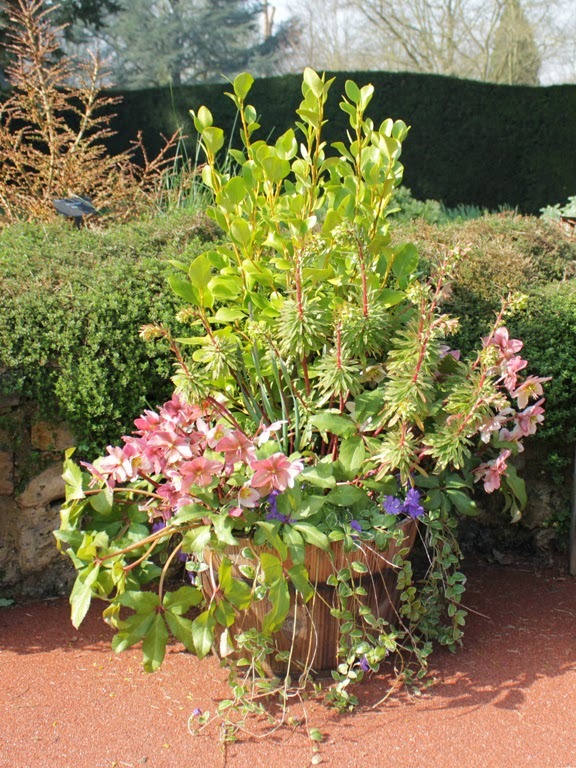 A pot can group plants together to be viewed in a way that couldn't be done in a border. The pot can be moved to a different spot if needed and if any of the plants look tired, they can be quickly replaced later in the year. The downside is that they need vigilant watering to ensure the soil doesn't dry out; plastic pots, although not as pretty as terracotta, are better at retaining moisture in the soil. 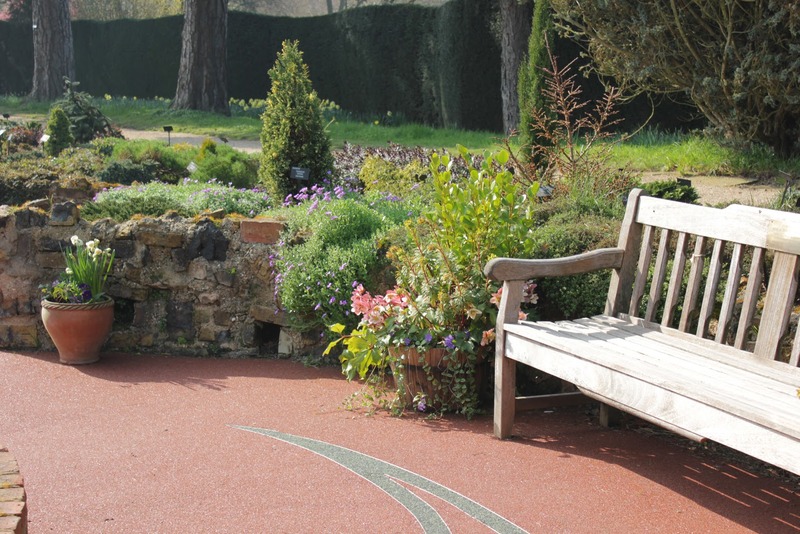 For now though, this pot invites the walker to stop awhile and sit in the sunshine on this handy bench. In my own garden, so to speak, I have large pots planted up with herbs: sage, surrounded by thyme and violas (edible flowers) and a spring pot of pompom daisies (bellis perennis), violas, ivy trailing over the sides and pansies in the middle. Lilies are buried deep within this pot and will come up among the spring flowers; mini calendula and nasturtiums are also good flowers for pots. All of these, apart from ivy, have edible flowers. The herbs, of course, are completely edible. No wonder British gardeners are obsessed with the weather! This time last year there was snow on the ground, yet this past week has been dry, sunny and, at times, hot enough for (a British) summer. I even watered the veg patch yesterday evening - can't have my germinating seeds drying out. I took a risk and outdoor sowed spinach, lettuce, broad beans and beetroot last weekend, just on the off chance that temperatures weren't going to dip anytime soon, but I have a roll of fleece on standby just in case. If weather forecasts are to be believed, it seems London might have rain and lower temperatures by the end of next week - more 'normal' for this time of year but who knows what that is any more? This week though, there have been lovely things: a chance find of Skye Gingell's book 'A Year in My Kitchen' in a charity shop (flavourful recipes for seasonally grown food), a gift from same charity shop of some Mottistone lettuce seeds and a wonderful spring walk around the Capel Manor grounds before settling in for a study day in the library. Mindful walking + books always feels good to me. Clubcard points have been converted into a subscription to Garden Answers mag so there's something to look forward to - the postman's knock is so much more exciting when the delivery includes a gardening magazine. 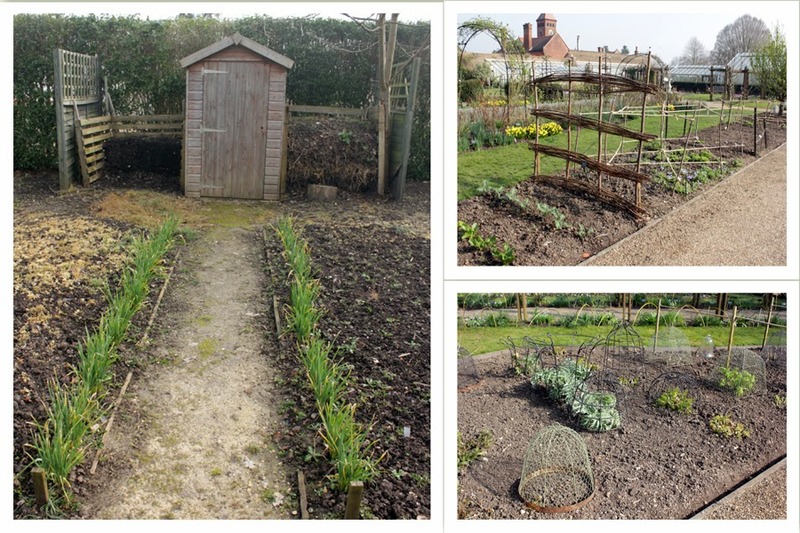 Some good ideas caught my eye at Capel: spring onions sown to line a path (love the shed! ); willow canes woven together in the walled garden - I'm guessing for a bean or pea hurdle; canes tied to hazel poles for dahlias to grow through and a random selection of vintage cloches to protect growing veg. Just lovely. I sowed a tray of sweet peas a few weeks back, they've germinated at different rates but are now 80% through. Unsurprisingly, the newest seeds have all come through, strong and healthy. I've been leaving them outside on my balcony during the day and even left them out overnight last night. One more set of leaves and they'll be pinched out and then planted shortly after, weather permitting. I've bought a large bundle of dried and lacquered willow sticks from Ikea - sold for indoor decoration but perfect for wigwams and cheaper than bamboo canes. In the garden, there's enough Cerinthe available to pick a few stems for a vase, here paired with flat leaf parsley from a huge mound that flourished throughout the mild winter. Home-grown flowers indoors really herald spring for me. There have been some not so lovely things - my teenager has been off college with a flu-like illness for over a week (now better and every tissue in the house used up) and my computer keyboard was also ailing - the delete and space bar keys stopped working. Bit tricky that, but I've been making do with my iPad. All is well though as the keyboard was still in warranty and the Apple Store just swopped it over … with no waiting! That put a smile on my face. The one thing that I really meant to get done (and didn't) was to write up a post to link to Lucy's tree following on her blog, Loose and Leafy. It's taken me ages to decide which tree to focus on; living five minutes from Hampstead Heath (humungous weeping willow) and visiting Capel Manor gardens (Wych elm, Amelanchier, Acer and crab apple) every week has given me quite a choice, and then there's my own fruit trees, plus a gorgeous potted nectarine in the Which? trial gardens … I've been thinking it over all week, made my decision, took photos and then missed the deadline for this, the first month. The information won't be wasted as I'll write it up anyway so that I can refer back to it next month, on the 7th. And now for a teaser: I wonder if anyone can guess which tree I chose to follow? It is a long held ambition of mine to create a little cottage garden with flowers that can be gathered for indoors. I'm limited by the tiny veg patch which is for food growing but I've introduced a few flowers over recent years, either edible or to attract beneficial insects. I get so much pleasure from these few flowers that I want more - but which are the best to choose from the vast selection of seeds out there? 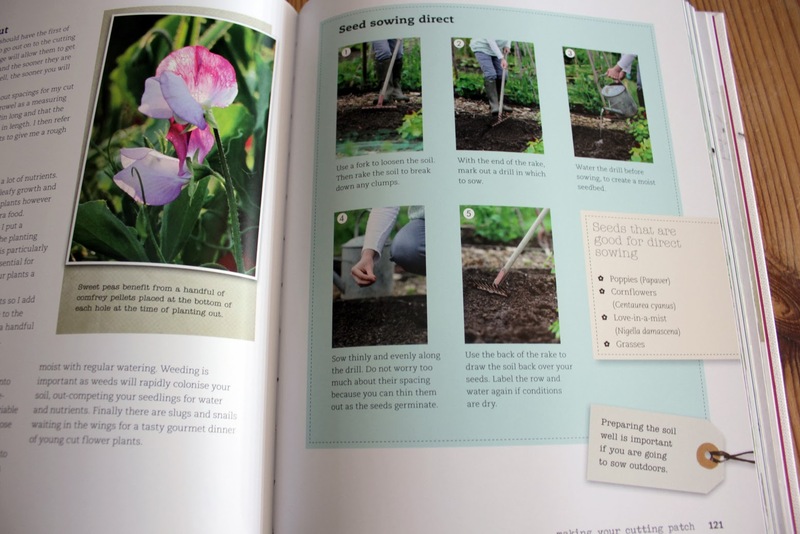 With perfect timing for the seed sowing season, Louise Curley (aka Wellywoman) has provided the answers in her newly published book 'The Cut Flower Patch'. 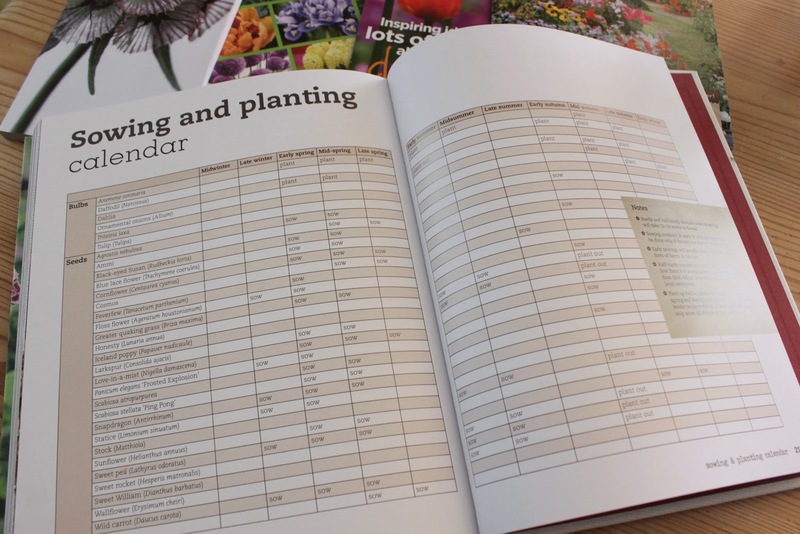 Louise, a trained horticulturist, has spent the past two years putting together her first book about growing flowers on her allotment and in her garden in Monmouthshire, UK. (Read Louise's posts about writing the book here and here.) Louise writes a jolly good blog so I was confident that her book would be equally good. Having now read it, and actually used her advice, I'm pleased to say I was right. First off, the book is beautiful to look at. The front cover is very striking; the rest is gob-smackingly gorgeous. Photos are by the very talented Jason Ingram and the layout is also very pleasing. 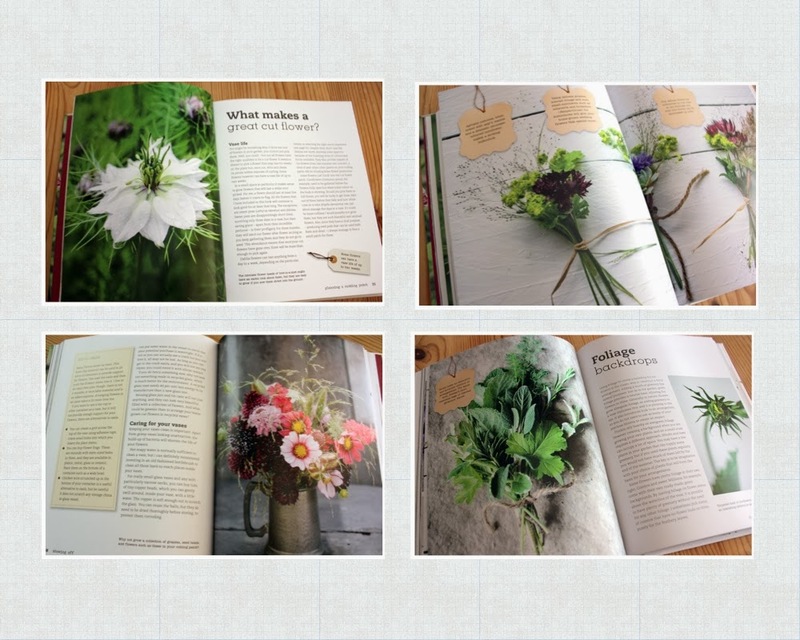 Everything has a very fresh, natural feel so you want to keep rifling through the pages. The text is accurate and well researched with excellent practical advice - just what you'd expect from an experienced gardener - and with a warm, helpful tone. We've all been overwhelmed by the vast range of seeds available today; in the past, I've chosen seeds on looks only to find that they're tricky to grow. Louise writes of just 23 annuals plus bulbs, corms, tubers and filler foliage, expanding within each category to name the varieties that she's found perform best, both in ease of growing and vase life. Simple and achievable. After reading the book, I feel that anyone, whether beginner or more experienced grower, could successfully grow a few flowers for cutting, even with only the tiniest patch of land. All the information is here with helpful hints sprinkled throughout. 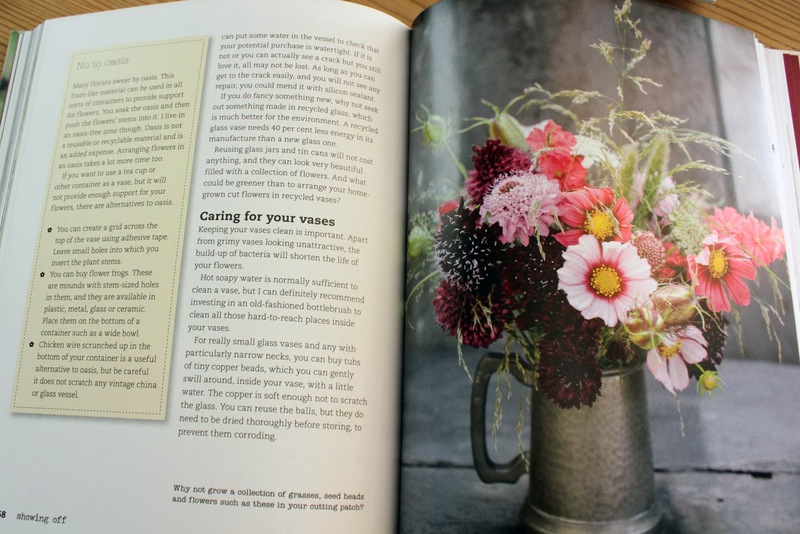 Chapters such as 'What makes a great cut flower? ', setting up and 'Caring for your patch', 'Growing from seed' and 'Why choose bulbs?' demystify the process and lead up to the grand finale, 'Showing Off', with page after page of deliciously beautiful flower arrangements. The penultimate section, 'Rich Pickings', looks creatively beyond the patch to seedheads, grasses, shrubs and hedgerows to extend interest throughout the year. But this makes it sound like a gardener's manual and there is so much more here. I found the personal writing style made it both hugely readable and informative. 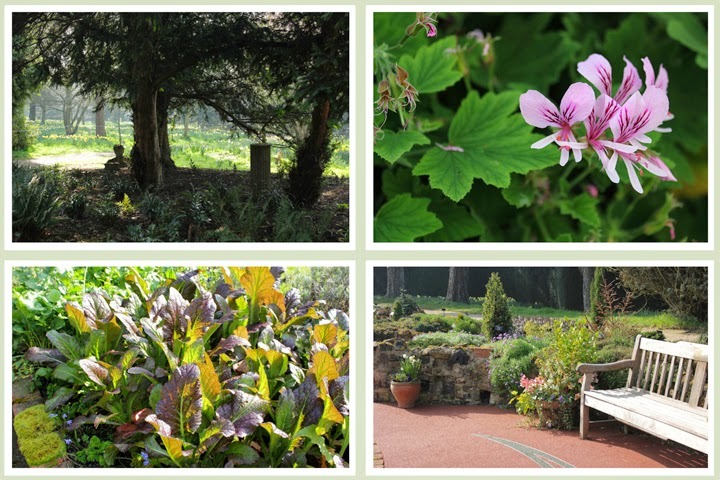 I particularly like the little bits of history and background to the plants and the 'Why grow it?' reason given for plant choices. As far as I could tell, no small detail of successful growing has been overlooked; read diligently, this book is as complete a workshop in growing flowers from scratch as you could hope to find. No wonder the RHS has added it to its bookshop shelves. The publishers have offered an additional copy of the book as a giveaway so that one lucky urbanvegpatch reader can have their own copy. (UK entries only, sorry.) To enter, just leave a comment and tell me your favourite flower to be in with a chance. The closing date is midnight on 21st March. Important! Please ensure your comment links back to a means of contacting you! Your Twitter name, blog, google+, email (all words eg 'at' 'dot') or Facebook page. My thanks go to Frances Lincoln for supplying me with a copy of the book for review. UPDATE: The giveaway has now closed. The winning entry was Susiesae - please get in touch before Wednesday 26th. If I don't hear from the winner, I will redraw from the remaining commenters on Thursday 27th. PS. 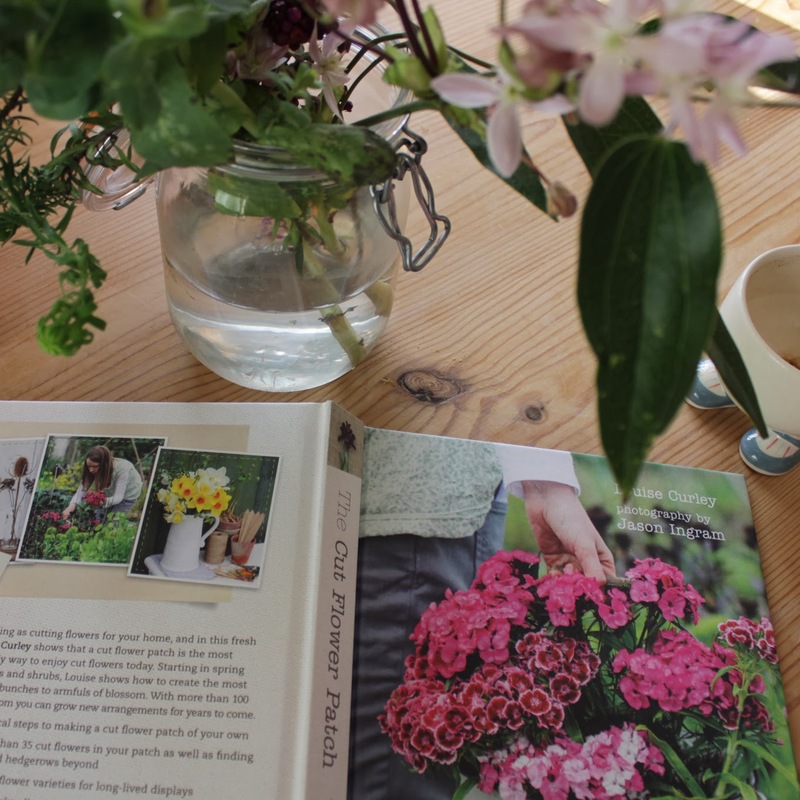 As recommended in the book, if you're starting a cut flower patch from scratch, check out the website of Cornwall based Higgledy Garden for a seed collection of the best flowers for cutting … and support our British flower growers at the same time! Blog readers may know that Louise (Wellywoman) is married to Ian, the writer of Piano Learner blog. Read his brilliant post about the background to writing the book with links to newspapers reviews and other blog reviews here. 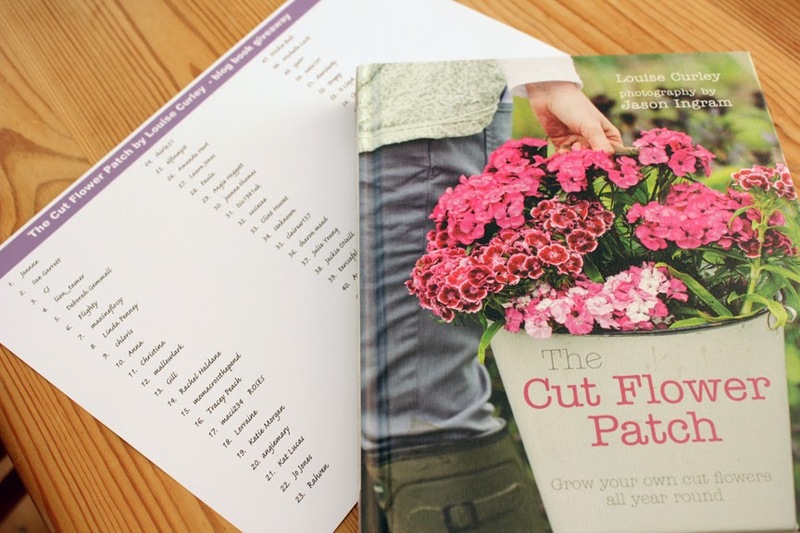 To order The Cut Flower Patch at the discounted price of £16.00 including p+p* (RRP: £20.00), telephone 01903 828503 or email mailorders@lbsltd.co.uk and quote the offer code APG101. Alternatively, send a cheque made payable to: LBS Mail Order Department, Littlehampton Book Services, PO Box 4264, Worthing, West Sussex, BN13 3RB. Here in the UK, after a month of storms and rain - and the occasional sunny day - there is a palpable sense of gardeners gearing up for spring and the advent of a new sowing year. 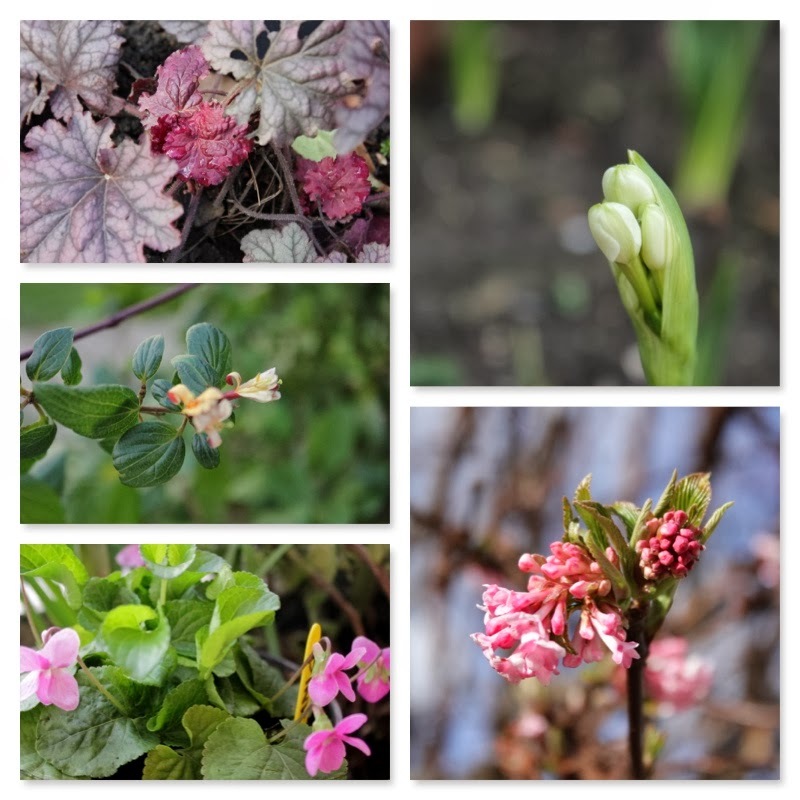 In horticultural terms, March is the nominal end of winter but the past few months have been noticeably mild and the weather here could go either way, with the threat of sudden frosts and outbursts of caterpillars never far away. Seen lurking on a Festuca glauca grass yesterday - lurking with intent? With the end of month post in mind, I took a walk around the veg patch gardens yesterday in the chill sunshine to check on progress. It's good to know what might need to be protected if we do have a cold snap. Clockwise from top left: cherry, plum, pear, cherry. Apples not showing yet. Next up, raspberry canes: I've left one old cane at 40cm in each batch every year and found this is a good way of having early fruit, with the new canes producing fruit into later summer. 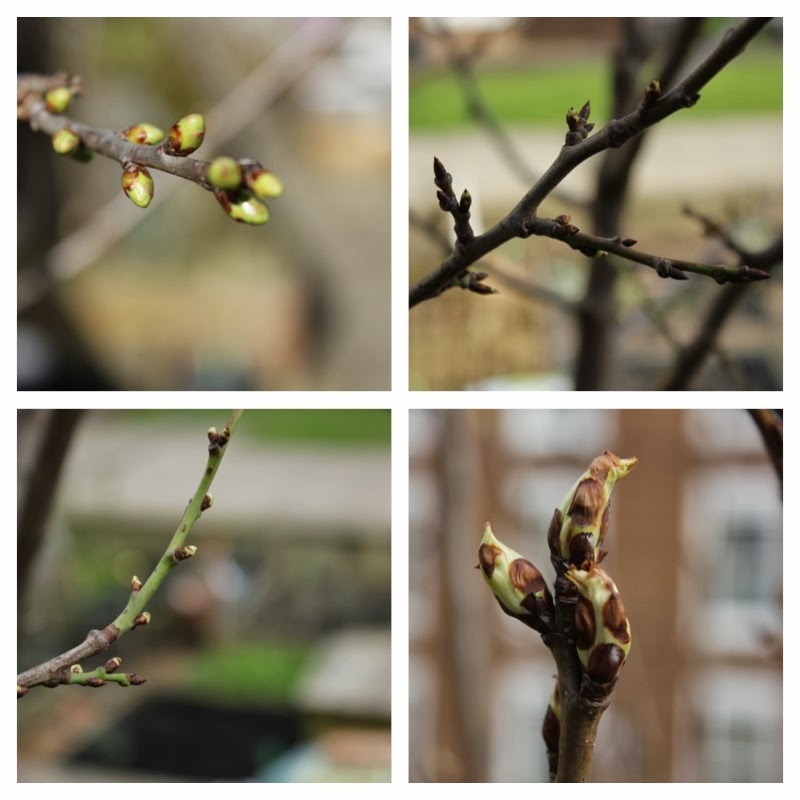 As expected, the old stems have fat buds about to burst into leaf, the new canes are just bright green leaves sprouting out of the soil. Quite a few a long way from the parent plant; they'll have to go. I grow Autumn Bliss, a popular primocane variety (late summer fruiting, no need to tie in the branches), but have been increasingly disappointed with the quality of the fruit, although last summer the small fruit was perfect for jam :) Funnily enough, the children don't seem to have the same high expectations that I do. This year though I'm raising my game and last weekend I bought 5 new canes of Polka; this is another primocane that allegedly has large, juicy berries. Keep the faith. Soft fruit doing well: new rhubarb, honeyberry, blueberry, strawberry. Glaskins Perpetual rhubarb is showing a lot of promise at soil level. 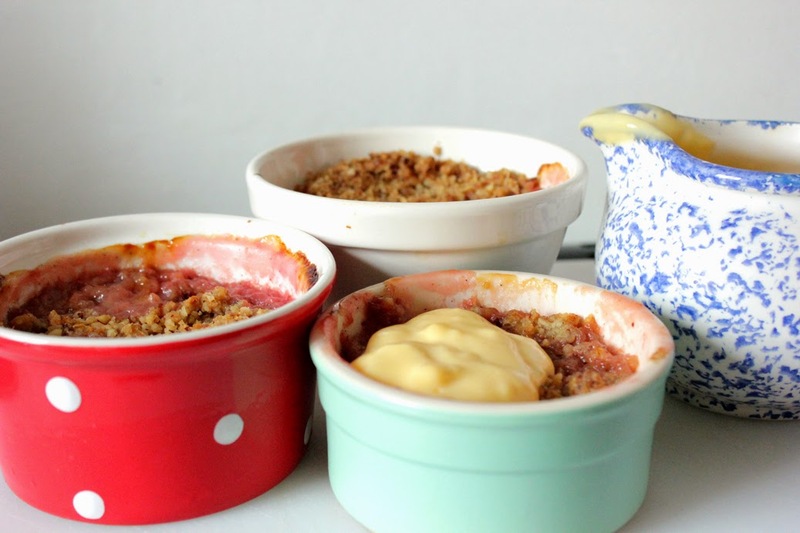 I am envious of those that are forcing rhubarb to enjoy earlier in the season. As I have only have the one rhubarb, I'm reluctant to weaken the plant to appease my impatience! Solution: I planted two little Red Champagne crowns last weekend, bought very cheaply from the supermarket. An absolute bargain if (when!) they thrive and I'll have lovely big leafy plants in my borders as a bonus. Last year I bought a Honeyberry plant at the RHS spring show. They're an alternative to blueberries but don't need to be grown in ericaceous soil. Too good to be true? I found out afterwards that at least two are needed for fruit to set. They're not self-fertile so last year's plant has now been joined by 3 little chums. I would have bought only one but the offer was for a job lot. They've arrived and need to be potted on. (Jobs for March!) 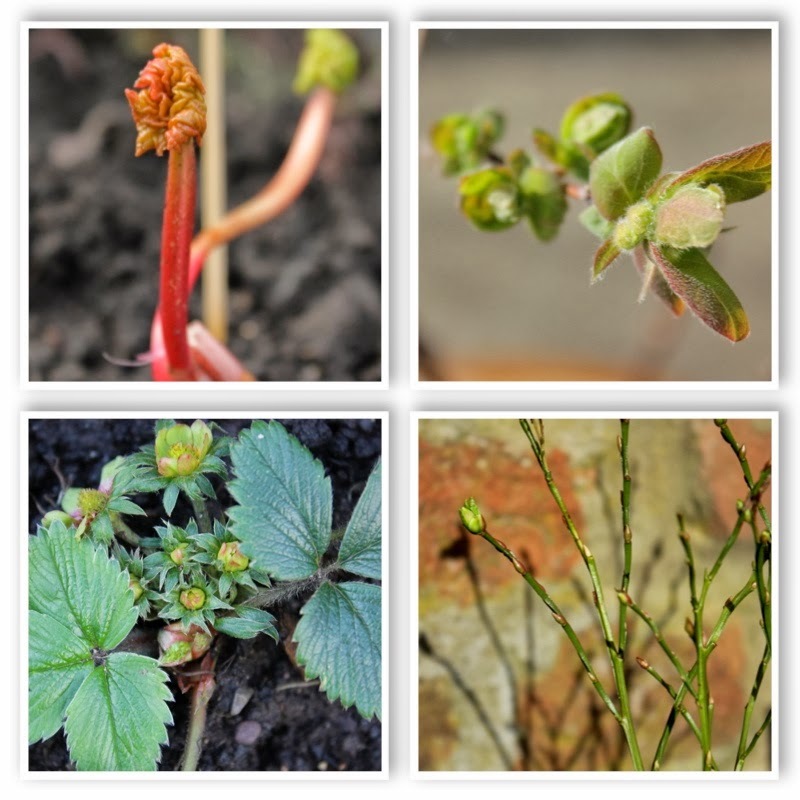 What with the redcurrant and gooseberry bushes (one of each) and quite a few strawberries, the veg patch will be soft fruit central come summer. With a bit of luck. A splash of pink for spring! Herbs that died back (or should have done!) 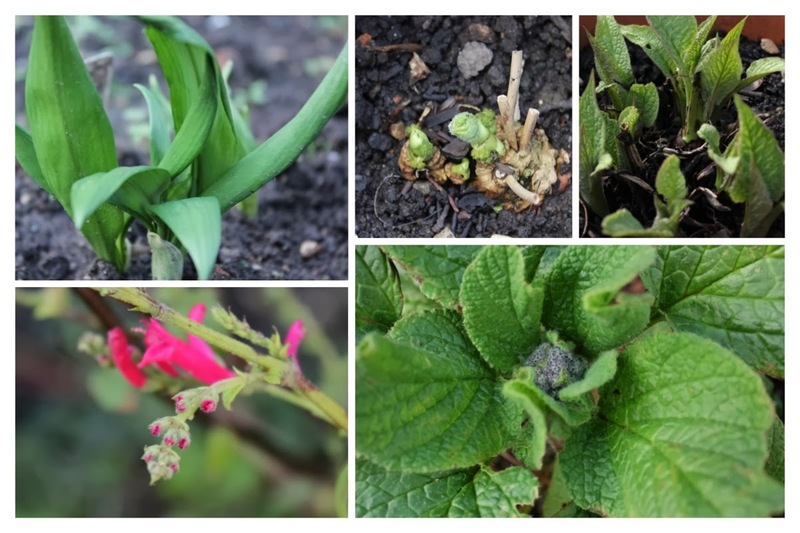 are reappearing (wild garlic, sweet cicely, comfrey, tarragon, mint, golden oregano) and the blackcurrant sage (which needs to be dug up and moved) has new flower buds. 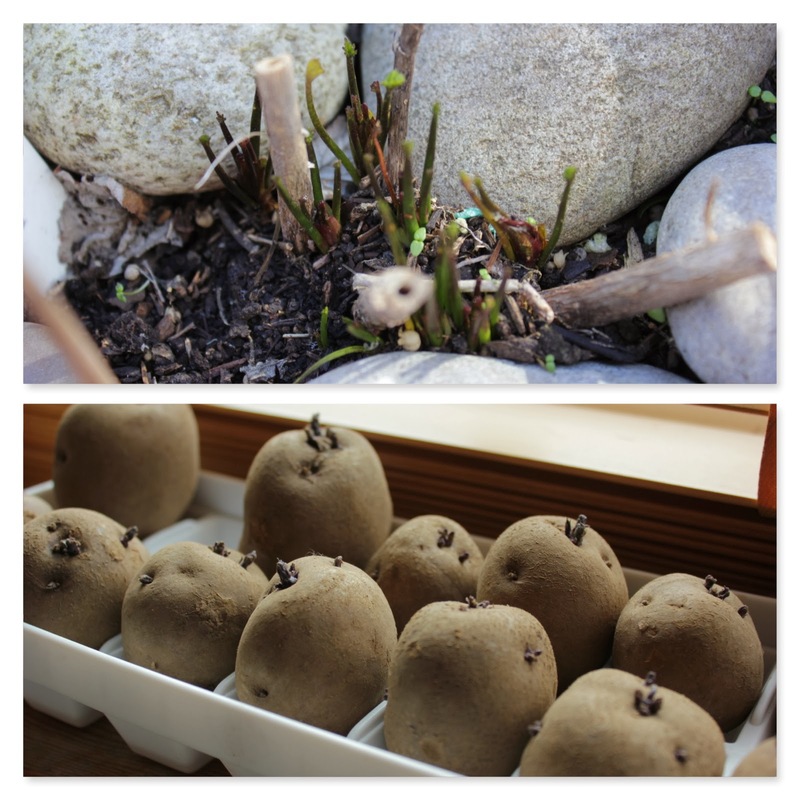 Flat leaved parsley has become an enormous (but still edible) mound, lavender has been cut back and moved under the fruit trees, marshmallow is sprouting (top photo, below) - as are the spuds chitting on my windowsill indoors. A lesson learned from the Great Dixter seed sowing study day was the advantage of sowing some hardier plants in the late summer, planting them out in the autumn or letting them overwinter in a cold frame. This gets them off to a good start in the spring as a strong root system will have had time to develop. 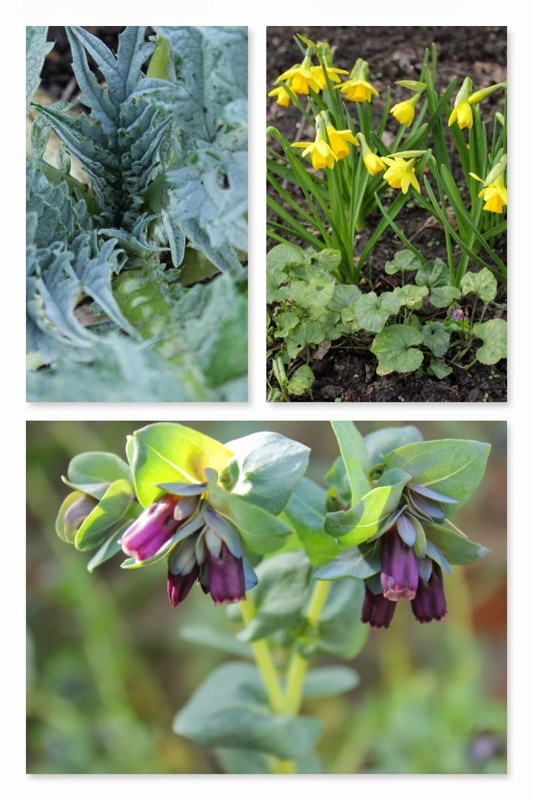 In the veg patch gardens, this theory is supported with August sown Cerinthe (quite my favourite plant at the moment as the stems look fabulous in a vase), Jacob's Ladder polemoniums (self seeded and growing strongly), Borage (about to flower), Cavalo Nero and white onions. I've even used some of the onions in a tomato sauce today along with parsley from my balcony. It's that mild winter, again. Considering I wasn't expecting to find much growing in the garden, this end of month review has shown how much the garden has evolved - not just as a 'veg patch', which was the original motivation for reviving the space, but as a proper garden. All this and seeds still to be sown! I'm getting quietly excited by the year ahead. I'm linking to both The Patient Gardener and Garden Share Collective for this end of month view. Thanks to both for hosting and sharing!